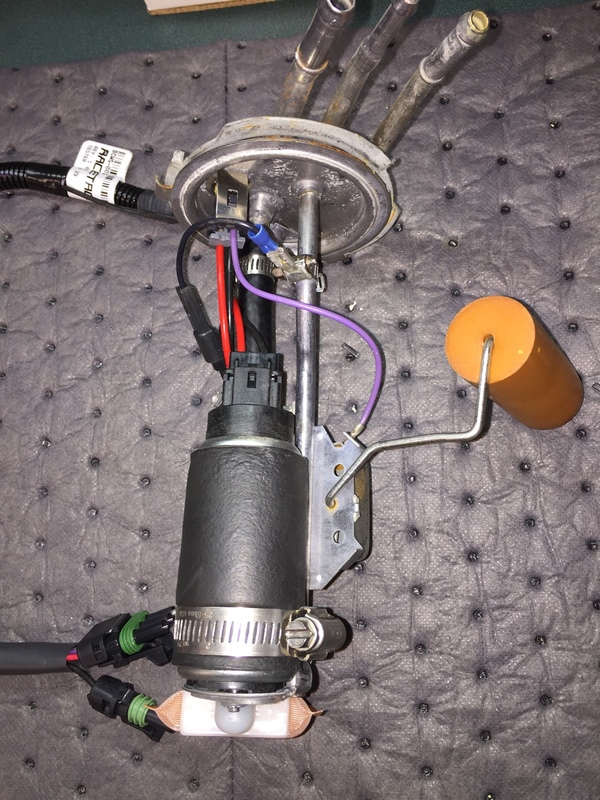 My Walbro GSS340 pump was about 5 years old, running E-85 for the past 3 years and I was having issues with it cutting out and pressure dropping off when in boost. I bought a Deatschwerks DW 300 (9-301-1000) 320 LPH pump. 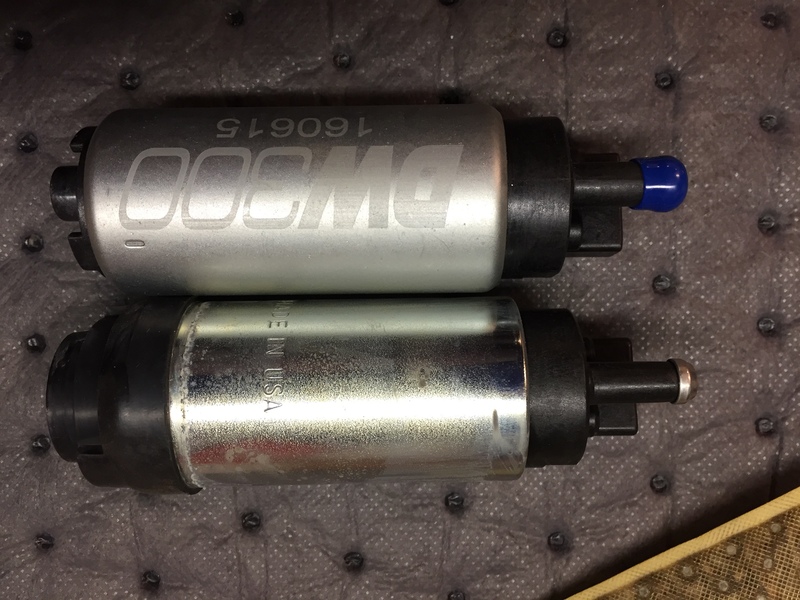 I also upgraded from 60# to 80# injectors. This pump does not fit into the stock hanger like the Walbro pump. The Walbro bottom is molded perfectly to fit in the hanger and the sock filter also fits like stock. 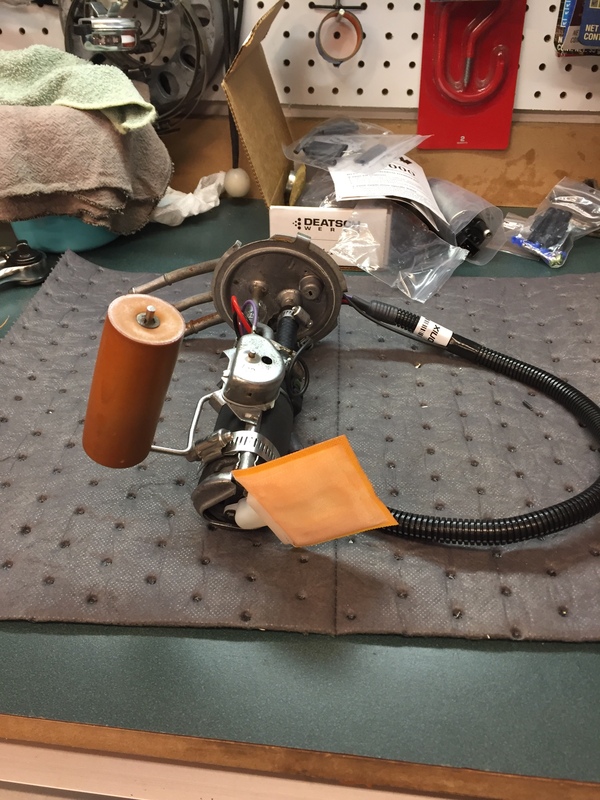 The DW pump has an offset inlet tube on the bottom which causes the filter sock to be clocked in an awkward position the makes getting the hanger assembly into the tank quite difficult. It also places the filter sock towards the side of the baffle pan in the tank that is not ideal, but it seems to be working fine. I could not get it to work in any position other than this. I had to trim the plastic nubs off the bottom of the pump which was easy with wire cutters and a file. 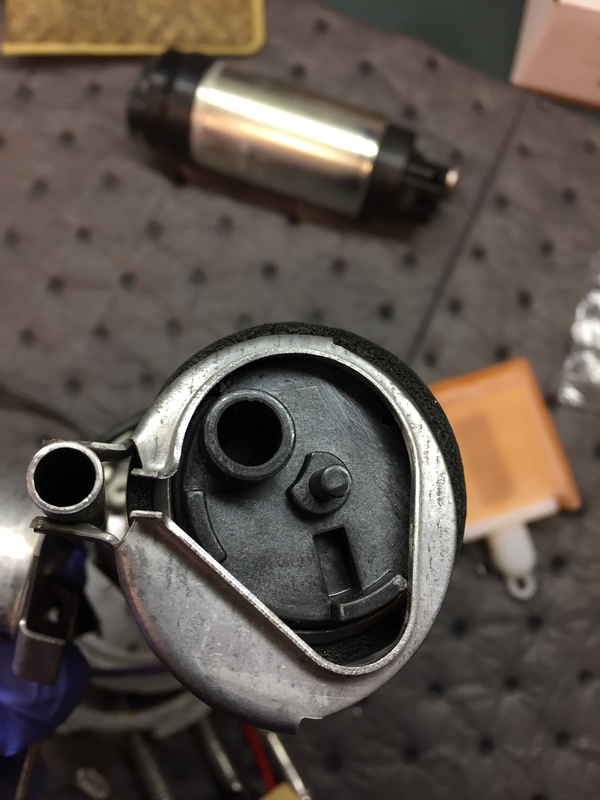 The pump then fit in the stock hanger with no other modifications besides using a stainless clamp to hold the pump in place. This is probably not even necessary since the filter sock and the feed hose at the top keep it from going anywhere. 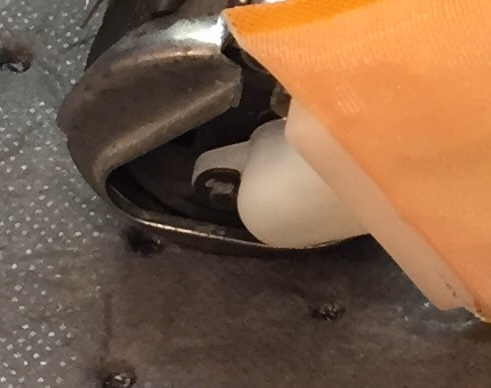 The small clip provided to attach the filter sock is nearly impossible to install. It was bending completely out of shape while installing. I had to remove it at one point and I lost it so I used a generic C clip and it worked much better. 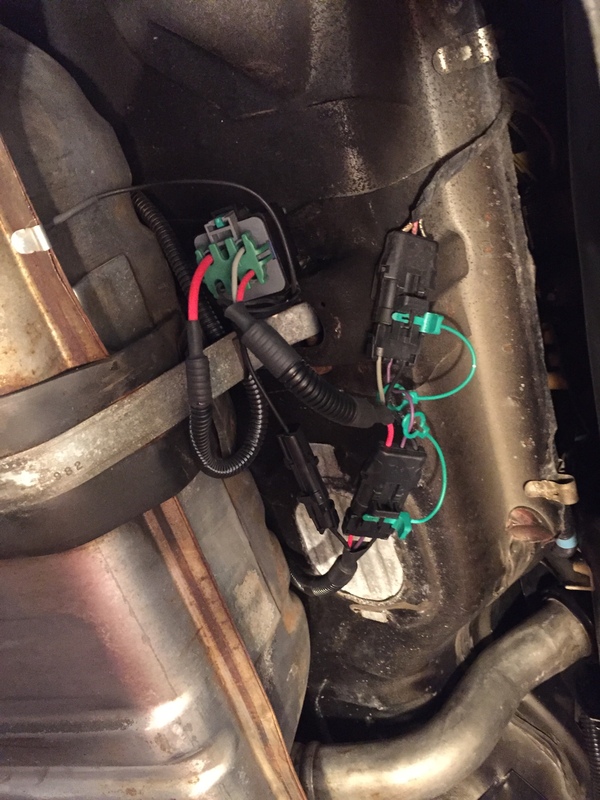 I figured while I was doing this I would upgrade the in-tank wiring and the intermediate harness that goes from the sending unit to the connector by the bumper (hot wire). 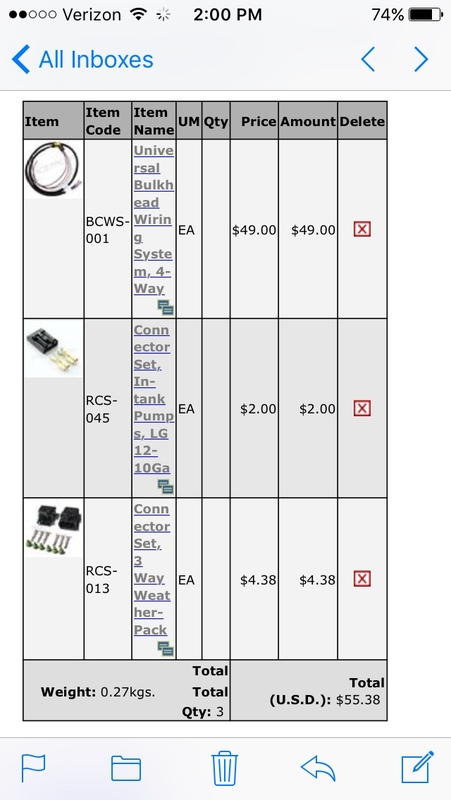 Racetronix no longer sells this harness made specifically for a GN so they recommended their universal harness kit and the connectors needed for the pump (Walbro and DW have the same connector) and for where it plugs into the hot wire kit by the bumper. The Racetronix adds a dedicated ground pin (black). 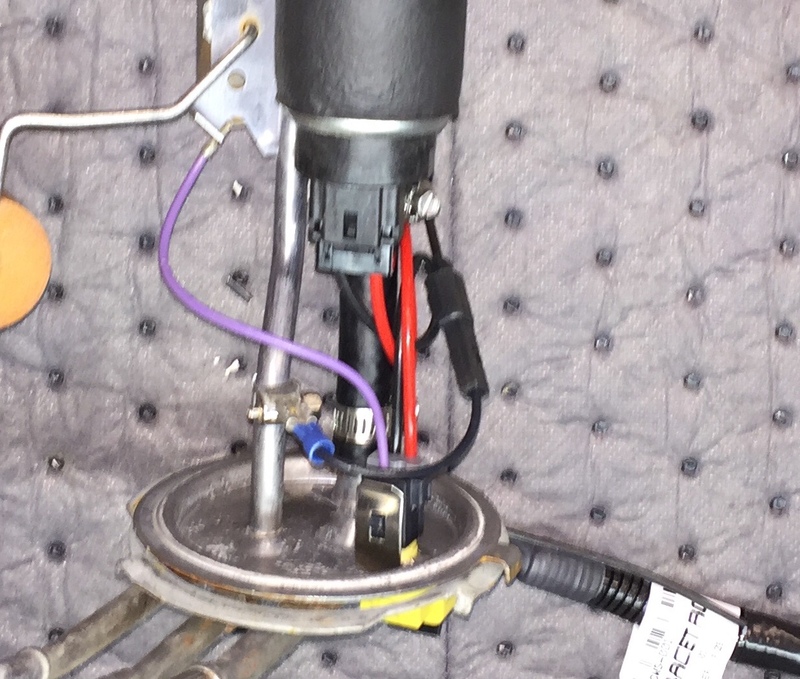 The purple is the sending unit signal which was removed from the factory connector with a paper clip and clips into the new racetronix connector. The red is the power lead for the pump. To ground the sending unit I ran the existing sending unit external black wire with the racetronix intermediate harness to the body ground by the hot wire relay. Alternatively you could just splice this wire into the harness, or maybe even leave it off since the tank is grounded through the racetronix Hotwire kit anyway. In my opinion, for this type of set up I would not recommend this harness. The wires from the sending unit to the hotwire kit appear to be exactly the same gauge as the stock harness- 14. 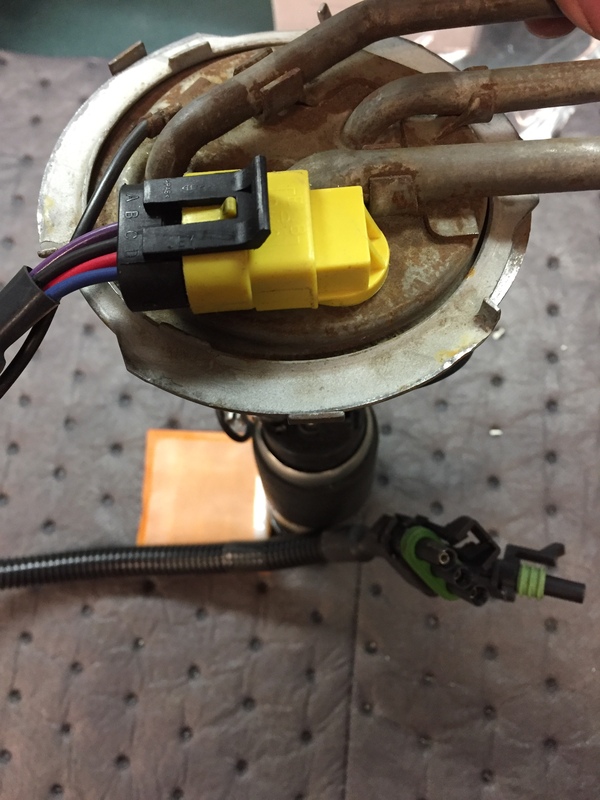 The bulkhead connector pins are also the same as stock and the new outside connector (yellow) had to be filed down to fit because it was hitting the outlet tube next to it. The in-tank portion was the same size wiring that came with my Walbro pump so there was no upgrade there either. So if your stock harness is in good shape I would just re-use that with a pump like this. When I fired it up the pressure was pegged at 60. I could not lower it at all. And I'm not surprised because looking at the stock return line you will see how tiny it is inside. The connection at the regulator necks down to probably 1/8" and the rest of the tubing is 1/4" at most. I had suspected this might be an issue but I tried it anyway. So then my next step was to run a new return line. I never really wanted to do this but it was time to just be done with this. 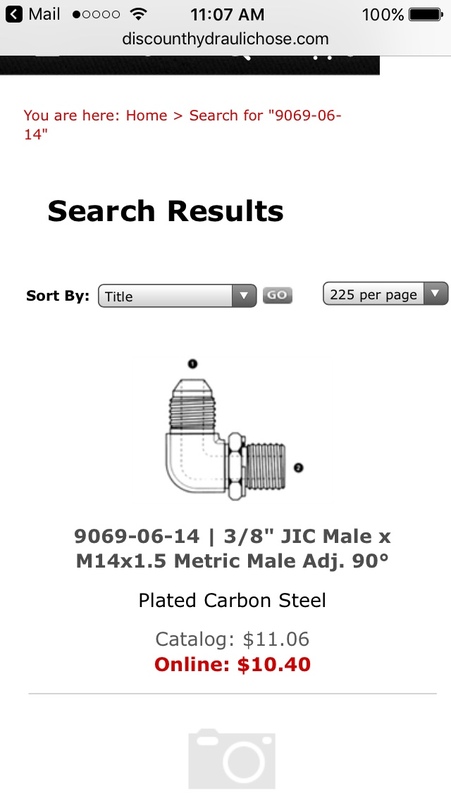 On the recommendation of Eric on the Turbotweak forum, I ordered this 90 elbow from Discount Hydraulic Hose (seems impossible to find anywhere else), a 16 foot 6 AN pre-assembled Nitrous Outlet 00-21020 braided line (PTFE lined) and a 6 AN to 5/16" Fragola 484205_BL hose barb from Summit for the connection in the rear. 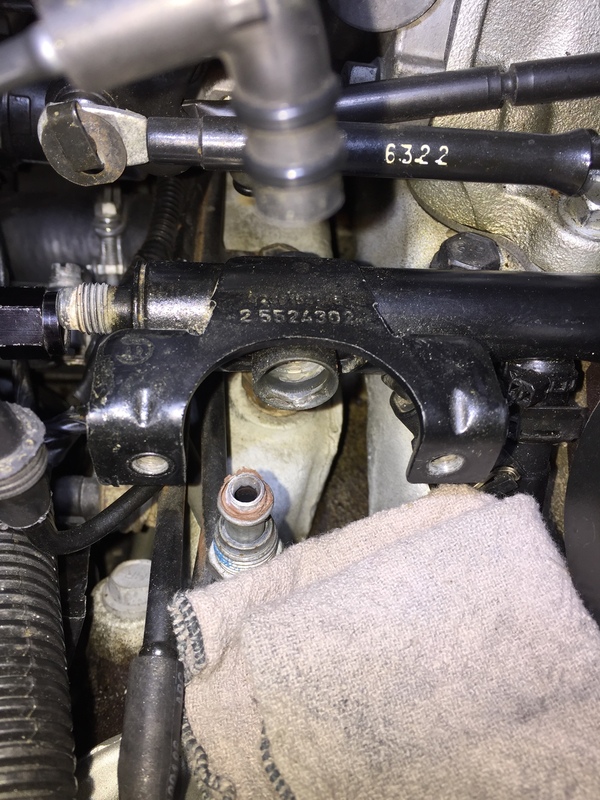 I then used a new piece (about 12") of 5/16 fuel injection hose rated for e-85 and hose clamps to attach to the factory return tube on the sending unit hanger. 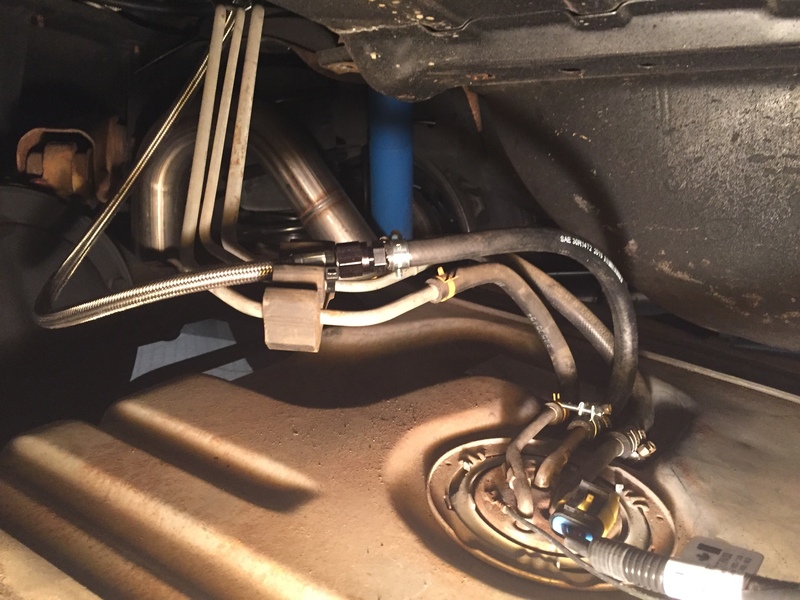 I ran the braided hose straight back along the intake manifold, down to the frame and followed the path of the factory fuel lines all the way to the tank. The silver hose with the black fittings is not super noticeable. I didn't want something standing out. After starting the car I now have full adjustment of the fuel pressure down to the 30's. Great write up my friend ! this should become a sticky for sure. Thanks. A lot of this info is on the board already but I wanted to try and summarize it all in one post. Nice write up! I did something similar last fall on my car. 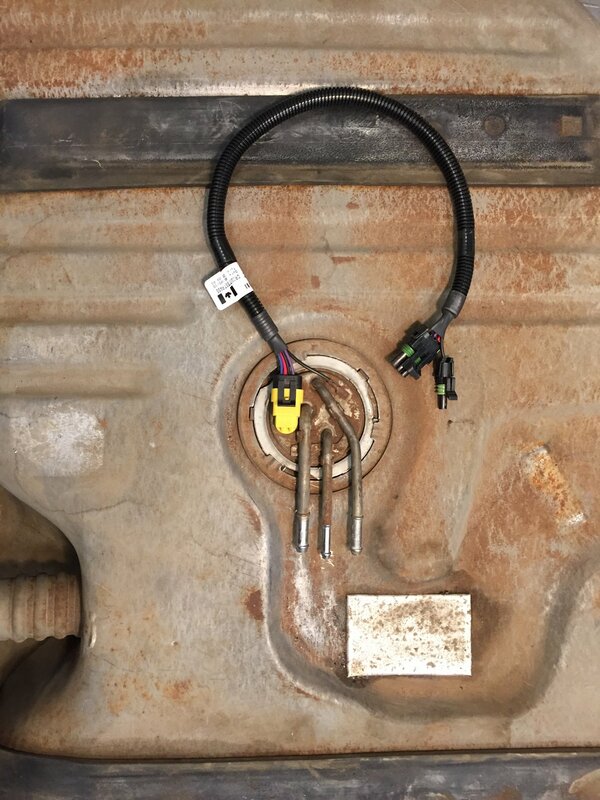 Just for an added tidbit for anyone doing this, make sure to get conductive hose anytime you're making a fuel line. The inside will be black. Using non conductive hose will result in a compromised line and a garage that always smells like gas. This is a great contribution to the board. Good work! 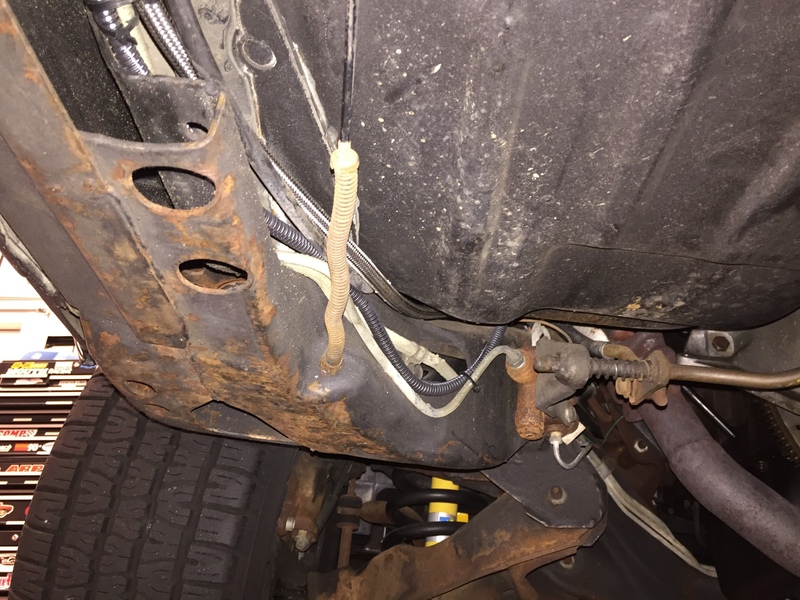 Another good item to add would be a dedicated ground wire running from the battery to the back of the car, connected to the fuel pump ground wires. This is also something that's often mentioned in other threads around here. A frame ground front and rear does make a big difference in flow. Along with setting the depth of the fuel sock when it comes to running out of gas or uncovering the pumps intake. 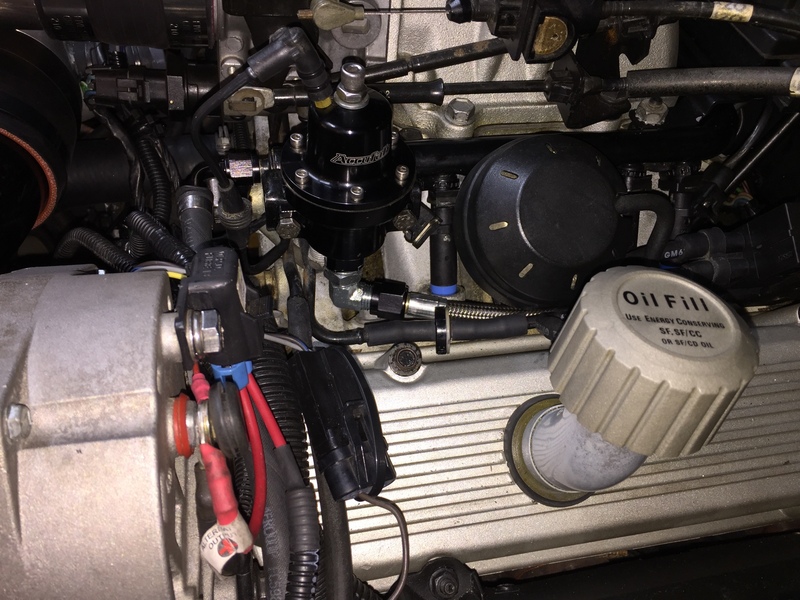 I had considered running a dedicated ground wire to the battery but I'm getting good steady fuel pressure at WOT now, which I wasn't getting before with the walbro pump. I tried drilling the fittings, no good. Needed to run -6 an to the tank. I also ran a dedicated ground to the block. I am logging fuel pressure with no issues. 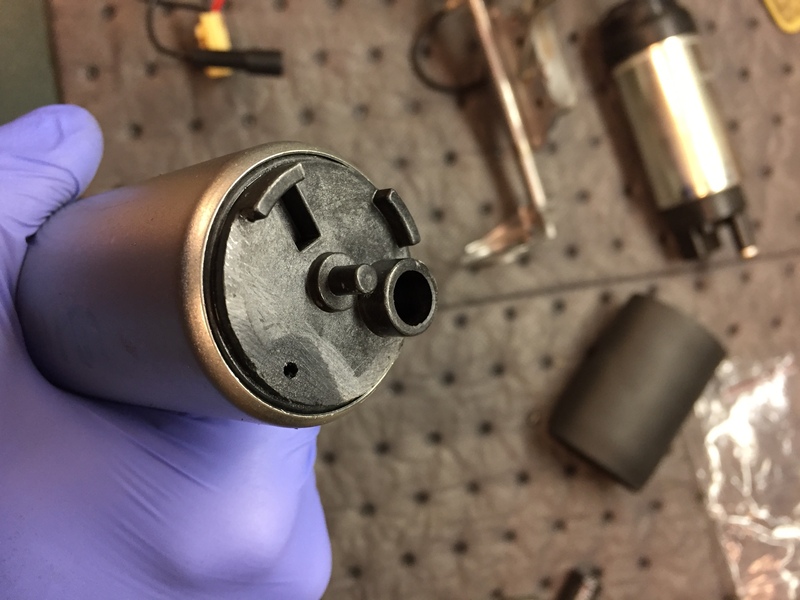 The filter sock design of this pump is its major downfall. I've already had one chuck its sock off in-tank when that cheesy retaining clip broke off. Of course for the price and performance it still can't be beat. Agree with that it's challenging. Agreed. That clip is pretty much useless. I used a generic c clip that fit much better. I did not try drilling any of the stock fittings. Seems like that usually doesn't help enough and I didn't want to waste any more time. I capped off the stock return line and left it in place in case I ever wanted to go back to the stock setup(doubtful). With the new 6 an return line the regulator is very responsive and is finally working like it should. Would a shorter braided line work or is the 16' piece needed? It was slightly longer than I needed but not by much. Could probably get by with 14' depending how it's routed but 16 seemed like a good length to me. Smart move dumping the factory return line. I like the idea of it, but what is the advantage if you aren't having any issues with the stock return line? This is a touchy subject with some members. I only have my own personal and very biased opinion and really don't care to share in fear of reprocussion from one particular member. He'll be along shortly....I'm pretty sure.